Welcome to the Q4 2017 newsletter! The exciting news this quarter is the launch of the new HDAWG, a high-density, multi-channel arbitrary waveform generator. The HDAWG is a milestone in our company history as it marks our expansion into signal generation tools. In contrast to our state of the art signal acquisition systems, the HDAWG does not use any lock-in amplifier technology. The first article below describes in detail the new HDAWG and the following interview with our project partners puts its application into a wider perspective. The MFIA, Zurich Instruments' first Impedance Analyzer, has within 18 months of its launch established itself as a smart alternative to the more traditional measurement instruments. In addition to the competitive pricing, our customers like the ease of use and the accuracy achieved over a wide measurement range. We are also building up our application know-how; see the article below on Deep Level Transient Spectroscopy (DLTS). Keeping our commitment to providing you with continuous efficiency and performance benefits, we will be releasing a new version of our LabOne® Software in December. And finally, we are now open for applications for our 1500 Francs student travel grant. Check out the eligibility criteria and apply now. A happy end to the year and best wishes from Zurich! Watch Sadik Hafizovic, Zurich Instruments co-founder and CEO, introducing the new HDAWG. The Zurich Instruments HDAWG multi-channel Arbitrary Waveform Generator (AWG) has the highest channel density on the market and is designed for advanced signal generation up to 750 MHz bandwidth. The HDAWG comes with either 4 or 8 DC-coupled, single-ended analog output channels. The outputs can be individually switched between direct mode, with maximized bandwidth and superior noise performance, and an amplified mode that boosts the signal amplitude to up to 5 Vpp. Two markers per channel are available, enabling precise setup synchronization while maintaining the full 16 bit output resolution. LabOne®, the Zurich Instruments control software, is a state-of-the-art software platform that smoothly blends the performance and flexibility of an AWG with the ease-of-use of a function generator. The platform-independent LabOne User Interface (UI) and a choice of APIs for LabVIEW®, .NET, MATLAB®, C, and Python enable easy measurement automation and fast integration into an existing control environment. Combine up to 8 HDAWG8 units to obtain 64 synchronous channels. The HDAWG is equipped with digital oscillators to generate the sinusoidal carrier of a signal independently of the programmed AWG envelope signal. It enables long signals to be generated with very fast waveform upload and precise phase coherence across many pulses. Carrier frequencies and phases that would otherwise be written to a static waveform are freely adjusted and swept. Thanks to the low-latency design, the HDAWG generates its first output sample less than 50 ns after detecting an external trigger on one of the TTL inputs on the front panel. This level of performance is essential for feedback experiments in quantum computing where device properties are short-lived and each nanosecond saved improves the experiment's outcome tremendously. 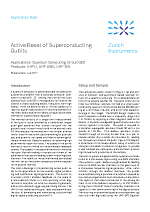 Superconducting Qubit Characterization describes some of the basic measurements and control patterns needed in every quantum experiment before actual computations can be made. Get in touch to schedule a demo with one of our Application Scientists and check out the HDAWG website for more information. 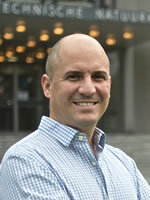 leads the Quantum Device Lab at ETH Zurich, Switzerland. Hello Leo & Andreas. Which quantum computing approach will win? On what time scale? 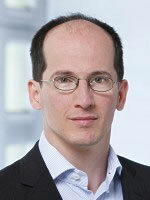 Andreas: I believe we get the definitive answer to the first question within the next 5 years. In the end, it will be an approach, which is based on nano- or micro-fabrication technologies, which are important enablers to solve the scale-up problem when it comes to building a quantum computer with 10’000 or more qubits. Where do you see your most important contribution? Leo: Our initial focus was on designing quantum hardware. Today my lab, and QuTech as a whole, works on all layers of the quantum computer stack. We address challenges that range from developing quantum processors to classical control electronics, compilers, and algorithms. Andreas: We dedicate our efforts to specific components and sub-systems, such as fast read-out with high fidelity or frequency multiplexed read-out. We also perform research on quantum algorithms that do not require error correction and that can be used for quantum simulations. When will quantum computing outperform conventional computing for the first time? Andreas: I think we will hear more news on quantum supremacy or the operation of a quantum computer demonstrating a true quantum advantage within the next one or two years. The interesting question is which problem will be solved and which applications will emerge from it? It will likely take another 5-10 years until we see quantum computers outperform classical computing on challenging problems like simulating molecular structures. What is the role of government projects? Andreas: Let’s take the IARPA LogiQ 5-year program in which we are working together with TU Delft, TNO and Zurich Instruments as an example. The program has very clear and challenging objectives and offers substantial funding. It focuses the activities of the participating teams on demonstrating a logical qubit that outperforms a physical qubit. How do you see the role of big companies like Google and Intel? Andreas: Today, the technology is still at a level where industry players need to partner with research groups. Large financial resources are not yet sufficient for a single company to build a quantum computer, I believe. In the long run, the big companies will take over when it comes to mastering the scaling challenge. Leo: I can specifically comment on QuTech's collaboration with Intel from which Intel and QuTech draw great mutual benefit. Intel has the knowledge and the capability to drive the development of quantum hardware to the next level and produce devices with a very high yield. Why are smaller companies like Zurich Instruments important, too? Leo: I think that SMEs can have a great impact in this field with their highly specialized know-how. In addition, their flexibility and boldness can make a big difference already in the short term. It’s not (only) about budgets, it’s also very much about having the right innovative spirit and drive. How do you benefit from the collaboration with Zurich Instruments, what were the highlights so far? Leo: Our collaboration with Zurich Instruments is an excellent example of what I just mentioned above. It’s a true win-win situation. We have the opportunity to contribute to shaping new products at an early stage, to assure they will address all our needs. Zurich Instruments, on the other hand, is close to the source and can gain early insights into the main application areas of the HDAWG. We value the speed and pragmatism of Zurich Instruments when it comes to finding creative solutions to sometimes unforeseen obstacles. Andreas: A highlight for us was to have the opportunity to make proposals and to get heard. It’s rewarding to see how ideas that were born in the lab can make their way into a commercial product that can be used by others. Why does the world need an HDAWG? How will it make your life better? Andreas: We like the high channel density, the very small footprint and the fact that synchronization not only works between channels of the same instrument but also across several instruments. Leo: AWGs are key to our experimental setup since they generate all waveforms that control a complex multi-qubit experiment. The need for AWG channels grows linearly with the number of qubits integrated on a quantum processor. The HDAWG offers must-have features like precise synchronization between channels and high channel density. In addition, the HDAWG will offer real-time linear filtering, which is essential for compensating signal distortions that occur when sending AWG pulses down to the sample in the cryostat. Another game-changing feature is the low-latency codeword based triggering, which is needed for feedback control and other key tasks. How were you involved in the development of the HDAWG? Andreas: We contributed to the specification of the instrument on its analog parameters and on requirements related to feedback latency. Similar to Leo’s team, we worked closely with Zurich Instruments to identify and address the issues occurred on the very first prototype instruments that we received this summer. 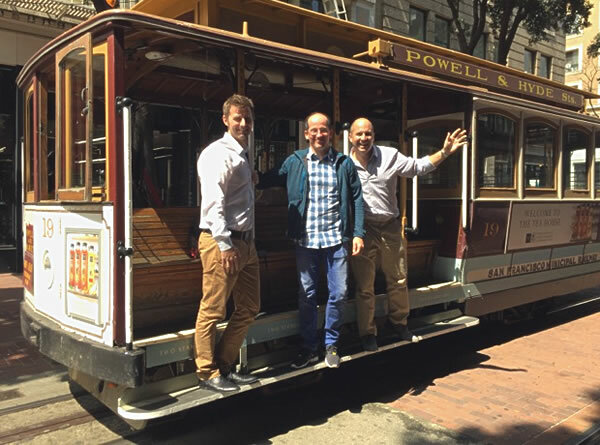 Niels Haandbaek, Zurich Instruments' AWG lead engineer, Andreas Wallraff, and Leo DiCarlo during a recent IARPA LogiQ project meeting in San Francisco. What were your highlights in San Francisco? Leo: Of course the bicycle ride across the Golden Gate bridge with Adrian, the project leader and chief cyclist of Zurich Instruments. More seriously, I really enjoy being in a room together with leading scientists working on the two most developed platforms for quantum computing. Researchers from the superconducting qubit and trapped-ion community are openly exchanging their experiences and reporting on their progress. It’s exciting to see the evolution of the technology every 6 months and to be a part of it. Andreas: It’s always great to have an occasion to meet the other Qusurf partners, but also to see how the other LogiQ teams progress. In San Francisco, we received recognition for what we have achieved so far, which is a big motivation for Qusurf to work with continued enthusiasm towards the next milestone goals. 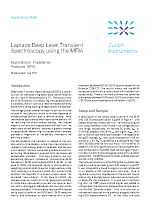 Our latest impedance related application note demonstrates how the MFIA, our 5 MHz impedance analyzer and LCR meter, is used for Deep Level Transient Spectroscopy (DLTS) in both the conventional method and the Laplace method (L-DLTS). DLTS is a powerful tool for characterizing electrically active defects in semiconductors. The technique involves acquiring capacitance transients while voltage pulses are applied. The instrumentation challenges are considerable. The note outlines how the MFIA plays a key role in the DLTS set-up by acquiring capacitance data with time resolution of 0.1 ms. It enables the transient to be well resolved over the full period of the transient, which can take several seconds. The note also describes the advantages of the MFIA over the discontinued Boonton 7200 for DLTS, such as flexible working frequencies, acquisition time and overload recovery time. Contact Tim Ashworth to discuss your impedance application requirements. 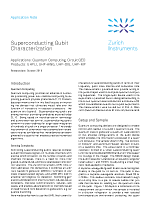 Are you a PhD student/Post Doc and (co-)author of a publication that mentions one of Zurich Instruments' products? Then don't miss the deadline for applying for 1 of 3 travel grants of 1'500 Swiss Francs! L. Vukušić, J. Kukučka, H. Watzinger, and G. Katsaros, "Fast Hole Tunneling Times in Germanium Hut Wires Probed by Single-Shot Reflectometry" in Nano Letters, Vol. 17, p. 5706 (2017). "Multifrequency Excitation and Detection Scheme in Apertureless Scattering Near Field Scanning Optical Microscopy" in Optics Letters, Vol. 42, p. 3157 (2017). Osama R. Bilal, André Foehr, Chiara Daraio, "Observation of trampoline phenomena in 3D-printed metamaterial plates" in Extreme Mechanics Letters, Vol. 15, p. 103 (2017).